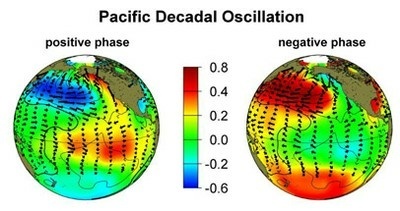 An image showing the positive / warm phase of a PDO and the negative / cold phase. The terms warm and cold refer to the temperature of water off the west coast of America. For the past several months, researchers have been tracking warmer temperatures in this northerly patch of ocean. And they're beginning to question whether we're about to see a switch in something called the Pacific Decadal Oscillation or PDO. "When you have the warm pattern of the PDO, it tends to be wet in the southwest U.S. and northern Mexico," he explained. Mantua says the PDO has been mostly in a cool phase since 1998, coinciding with some of California's driest years on record. Climate scientist Bill Patzert with the Jet Propulsion Laboratory thinks it's this PDO pattern that is responsible in large part for the severe drought in the region. "Perhaps in the long term, rooting for a [warm] PDO... is probably the most important thing for California and the American West," he said. Thursday and Friday at JPL's von Kármán Auditorium, Patzert will give a free public lecture on the PDO, El Niño and drought. He said even a strong El Niño isn't likely to supply all the water needed to get California out of a drought this bad. 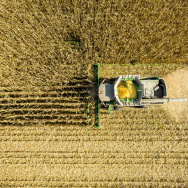 "In the long run these decadal or multi-decade variations in the Pacific are really the key to sustaining California agriculture and California civilization," Patzert said. That may be true for Southern California, but it is less clear how a warm PDO will affect Northern California, said NOAA's Nathan Mantua. That's because the northern part of the state is between the two regions that switch from wet and dry as the PDO shifts. "Northern California sort of sits between the ends of this sort of north-south see-saw," he said. Still, he's optimistic that a warm PDO is coming, since the major index predicting this pattern has been positive for 19 months. "Beyond that, it's going depend on what the winds do and the weather patterns," he said. Another wild card, according to JPL's Patzert, is how climate change will affect the PDO and related weather patterns. 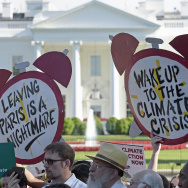 "As we move into the 21st Century, climate is shifting beneath our feet... nobody really understands what the impact will be," he said. El Niño vs. the Blob: Which will win out this winter?